As Bloomington and Monroe County prepare to celebrate the city’s bicentennial this year, we reflect on this story that Bloom published in 2007 that commemorates the 100th anniversary of the fish that sits atop the county courthouse. One hundred years ago, work was completed on our courthouse in the Square. But the origins of that building, of the weathervane in the shape of a fish that adorns its summit, and of Bloomington itself all took place—depending on how you look at it—either a century earlier or 250 million years ago. Scott Russell Sanders, essayist, novelist, teacher—our Mark Twain—casts a wondrous, pondering eye on that weathervane. Why, you may ask, does a weathervane in the shape of a fish swim atop the dome of our county courthouse, 600 miles from the sea? The explanations that circulate hereabouts range from sober to silly. My own theory tends, I suppose, toward the crackpot end of the spectrum, but I will share it with you anyway, because it belongs to my private mythology of this place. of the families who settled the town in 1818 may have migrated to the hills of southern Indiana from Massachusetts, where codfish whirled upon rooftops. Some think the weathervane is modeled on the perch in nearby ponds, even though it’s the size of a ten-year-old child. Some explain the fish as a zoological compromise between Democrats, who wanted a rooster, and Republicans, who wanted an elephant. Some regard it as a symbol of Christ. Others see it as a warning that the actions of government, including those carried out in the courthouse below, may be fishy. Still others claim that the blacksmith who is given credit for hammering the weathervane out of a copper sheet and coating it with gold leaf in the 1820s actually brought it with him when he moved to Bloomington from Louisville, and thus the fish hails not from an ocean or pond but from a river, the mighty Ohio. My own theory is that the courthouse fish swam up out of our ancestral memory, recalling the time when Indiana and the whole heart of the continent lay beneath a vast and shallow gulf, which geologists call the Sundance Sea. As the denizens of those inland waters died, their shells and bones settled to the bottom, forming a chalky mud that eventually hardened into limestone. Around 250 million years ago the heartland was raised above sea level by a collision between the North American and African plates, a prolonged stony grinding that lifted up the Appalachian and Allegheny Mountains, and Indiana has remained dry ever since. Although global warming may swell the oceans enough to flood coastal areas within the next hundred years or so, saltwater is unlikely to reach the heartland again any time soon. Meanwhile, I like to imagine that the fish atop the courthouse is keeping watch for the returning tide. Since I’m imagining, I think of it as a salmon—a coppery sockeye, maybe, overlaid with gold—spawned in a local stream and now seeking its way back to the deep. Whether salmon or codfish or perch, it’s a token of wildness, reminding us that our land is on loan from the sea and our own genes coil back through all our ancestors into those primordial waters. When friends who live on one or another of the coasts ask me how I can bear to live in the hill country of southern Indiana, landlocked, high and dry, I tell them my home ground is not really so high, only about six or eight hundred feet above sea level, nor so dry, because rain falls bountifully here and streams run through limestone caverns underfoot. Why, the place is so intimate with the sea, I tell them, that a salmon floats in our sky and our buildings rest on an old ocean floor. Civil war veterans raised funds to have the fish gilded anew … and to have it installed in its rightful place atop the courthouse. Limestone is the ruling rock in this place. It’s exposed in road cuts and creek beds. It dulls the blades of plows that scrape the thin topsoil. Bloomington is ringed by pits where the buff or silvery stone is quarried, and with mills where it is cut into elegant shapes. The foundations of the courthouse are laid on limestone and the building itself is fashioned out of it, as are many houses, banks, churches, and shops around town, as are tombstones in the cemeteries and monuments on the courthouse lawn. I delight in knowing that much of my city is made from the husks of creatures that lived and died hundreds of millions of years ago in the Sundance Sea, just as I delight in knowing that our sun and solar system and the earth itself—the copper and gold of the weathervane, the calcium and carbon of your body and mine—are made from matter left behind by an earlier generation of stars. Although my city is more durable than my body, both are fashioned out of recycled matter, both are caught up in the surf of decay and renewal, both are destined to survive for a spell and then yield their stuff to new constructions. At first glance nothing about the court-house or the Square that surrounds it, aside from that airborne fish, looks the least bit wild. The Square is a patch in the latticework of streets laid out precisely north and south, east and west, part of the survey grid that stretches from the Ohio River to the Pacific. The Ordinance of 1785 provided for that survey as a way of reducing the unruly countryside into salable chunks. In America’s interior there would be no more reckoning, as in the original colonies, by trees and boulders, rivers and hills; here the land would be sliced up into square sections as abstract as any proof in geometry. Today, a hawk spiraling over Bloomington looks down on a checkerboard pattern softened only by a fuzz of trees. At the center of that checkerboard, on a block of lawn dotted with war memorials, flagpoles, and Civil War cannons, rises the courthouse itself, some eight stories high, massive and magisterial. The style of the building is a Beaux Arts mixture of classical elements—columns, pediments, balustrades, heroic statuary—capped by an octagonal clock tower and a mint-green dome. Ribbed like an old-fashioned football helmet and topped by curlicues worthy of a wedding cake, the dome gets its color from the oxidation of copper. The whole affair is orderly, stately, solid, and symmetrical, proclaiming to all who care to look that here is the seat of government for a prosperous and law-abiding citizenry. We’re not always so law-abiding, of course, which is why we need courts and judges and jails. No sooner had the founders of Bloomington laid out the town in 1818 than they built a courthouse of logs. Made of timbers cut from nearby hills, it consisted of two rooms separated by a passageway and joined by a common roof, a style known appealingly as dogtrot. Each room had a single window facing east to let in the morning light. A shelf in one of those rooms held the town’s first library. The court met there in summer, the school in winter. THE “FISH FAMILY” IS STILL AROUND—Nancy Seward Taylor is the great-great grand-daughter of Austin Seward, maker of the courthouse fish. After living in New York and Texas, Taylor moved back to Bloomington last year. The new county, named Monroe in honor of the reigning president, soon outgrew the wooden dogtrot, and so the commissioners ordered the construction of a larger courthouse made from brick. The bricks were fired from a local deposit of clay, which was the off-scouring of rock from the Appalachians and Alleghenies. So the new courthouse, completed in 1826, was sheathed in a skin of baked mountain dust. Painted bright red with white trim, it soared from limestone foundations to a sharp steeple, up and up until it culminated at the very tip in a weathervane shaped like a fish. A man named Austin Seward either brought the copper fish with him when he moved to Bloomington around 1820, or else he fashioned it in his local blacksmith shop. Whichever the case—the stories differ—he mounted the weathervane on a post that hardly budged in the breeze, so it wasn’t much good at nosing out the direction of the wind. Before long the gold leaf began to fray. When the county once again outgrew its courthouse in the 1850s, the commissioners were inclined to retire the fish, but local voices rose in its defense. It was given a new coating of gold by Seward’s son, and it was mounted on ball bearings to make it more responsive to the wind. Back up it went on the enlarged courthouse, and there it stayed for half a century until the commissioners decided to replace the brick courthouse with an even larger one of limestone. When the cornerstone for this grand edifice was laid in 1907, there were funds in the con-struction budget not only for the finest limestone from local quarries, but also for stained glass in the windows, murals in the rotunda, marble for the floors, cast iron for the balustrades, mahogany and oak for the railings and trim, brass for the lamps, and copper for the dome. But there was not one dime for repairing or remounting the battered weathervane. Once again an outcry arose in defense of the fish. Civil War veterans raised funds to have the fish gilded anew, this time by Seward’s great grandson, and to have it installed in its rightful place atop the courthouse. This limestone palace offered a public toilet and a room set aside where families could rendezvous when they came downtown. Friends would say, “I’ll meet you under the fish.” Enemies threatening lawsuits would say, “I’ll talk to you under the fish.” When folks came in from the countryside to do business in town they often picnicked in the shade of the trees on the courthouse lawn, leaving crusts and rinds on the grass. These scraps attracted so many dogs and cats and flies that the same commissioners who had slighted the fish in their building plans now ordered the cutting down of the trees. This provoked another outcry, which led to the planting of oaks, maples, and sweet gums, which still comfort us a century later. A century later, the limestone courthouse still presides over the city, but only because of the hard work and stubborn affection of many citizens. By the 1980s the interior had been carved up to provide additional offices and courtrooms; the furnace had become wheezy, the windows leaky, the pipes rusty, the wiring risky. When a grand jury, acting on advice from the fire marshal, threatened to close the building for safety violations, some commissioners called for tearing it down and putting up a sleek tower of glass and steel. Yet again an outcry arose, this time in defense not merely of the fish but of the grand old courthouse itself. By then I had been living in Bloomington for a decade; I had served on juries in the solemn building, had paid taxes there, had run my hands over its limestone flanks. I had come to see it as a symbol of our local landscape, quarried and shaped by local skills. I couldn’t bear to think of a wrecking ball smashing all that labor from carvers, sculptors, muralists, stained-glass artists, masons, and carpenters. I couldn’t imagine the gilded weathervane swimming atop a steel tower, couldn’t imagine wishing to run my hands over the flanks of a glassy box. So I added my voice to the uproar and my signature to the petitions for saving the courthouse. Fortunately there were many passionate defenders, including elders, students, business people, and some elected officials. When the council met to decide whether to renovate or demolish, those in favor of preserving and restoring the courthouse prevailed by a single vote. I rejoiced, and it seems the whole community rejoiced, because the restoration of the courthouse and its weathervane, completed in 1984, set off a flurry of renovations downtown. A hotel, a creamery, and the Masonic lodge were turned into offices. A train depot was turned into a Japanese restaurant, a funeral home into condominiums, a warehouse into an antique mall. A car showroom became a convention center, while another one became a café. The old Carnegie Library became the county historical museum. The former city hall was transformed into an arts center, and a nearby cinema into a concert hall. A one-time furniture factory, complete with skylights set into a saw-toothed roof, now holds the city hall as well as lawyers’ offices and high-tech businesses, and the adjacent parking lot now hosts the Farmers’ Market. Thanks to the Market, produce flows once more into the city from the countryside. If you go inside on a bright day and walk into the rotunda and look up, you will see a golden light shining through stained glass, as if you were staring into the throat of a daffodil. Many of the shops on the courthouse Square have also been restored, and every single one is open for business. The old five-and-dime is now a bakery, the former hardware store now sells books, the one-time department store recently held a rug shop and a science museum for kids. Within sight of the courthouse you can find bars and banks, an adventure outfitter, two cooking shops, a photography studio, a recording studio, a furniture store, an ad agency, a realtor, a grocery. You can park where the hitching racks used to be and stroll around the Square to buy sporting goods, eyeglasses, musical recordings, hobby supplies, bicycles, clothes, jewelry, cigars, guitars, or chocolate. You can fraternize down there with the Moose, the Elks, the Masons, the Knights of Pythias, or the Odd Fellows. One shop will sell you the statue of a Union soldier wielding a bayonet, another will sell you a wicker motorcycle, and another will sell you a leopard-spotted brassiere. You can study yoga on the Square, plan a trip, frame a picture, play pool, eat cuisine from Afghanistan or Ireland or Morocco, drink local or exotic beers, have your fortune told by a clairvoyant, get a massage or a manicure or a tattoo. July Fourth parades, candlelight vigils, protest marches, noontime concerts, political rallies, all focus on the courthouse. On Friday and Saturday nights teenagers cruise around the Square in pickup trucks and jalopies, or they park nearby and sit on the hoods of their vehicles to gab. On summer weekends artists sell their wares from booths under the shade of the courthouse trees. Near Christmas, musicians dressed as Santa Claus show up on a fire engine to play carols on tubas, beneath a canopy of lights that stretches outward from the courthouse to the shops facing the Square. 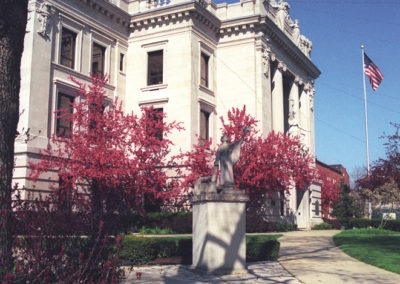 In spring, about the time the water is turned on in the Women’s Christian Temperance Union fountain, pink crab apples bloom along the walkway leading up to the main door of the courthouse. If you go inside on a bright day and walk into the rotunda and look up, you will see a golden light shining through stained glass, as if you were staring into the throat of a daffodil. The vitality in Bloomington’s downtown swirls around that green-domed, silver-flanked, statue-bedecked, fish-crowned courthouse. This energy reminds us of why we gather into communities to begin with. We come together to share gifts, to practice our talents, to nurture and inspire, and take care of one another. We come together to build what we could not make separately. Everywhere I look in the heart of my city, I see the handiwork from past generations now carefully restored. I see the results of our gathered powers. I see above all the courthouse, this expression not merely of our bedrock faith in civil society but of our actual bedrock, lovely limestone, a cake of past lives hardened on the floor of the Sundance Sea. To view the original PDF of this story, click here.